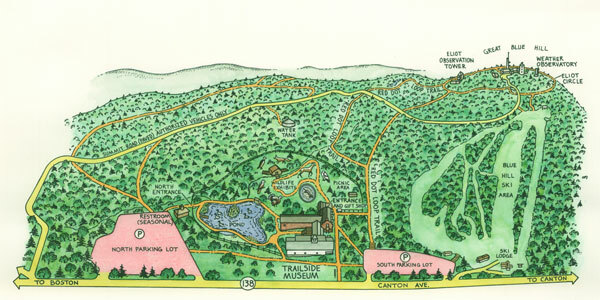 The Great Blue Hill trail map, courtesy of MassAudubon. The noise has been getting to me. It started last month, spending so much time in Downtown Crossing. My days down there were mostly spent hanging balsam wreaths and setting out other Christmas decorations. The sound there is endless, all engines and heavy gaits and voices. It’s not the nicest part of Boston; there’s a lot of misery and a lot of seediness. At first I took pleasure in bringing green to the grey, planting spruces and spring bulbs, reaching the bowed wreaths up ladders. But as December darkened the noise grew too heavy to bear. Nearly everything else in my life is quieter and less crowded, but that sound has stayed with me—the drone and the colors. And the shapes of humans, sometimes hardly anything but a harsh shadow. There are a lot of shelters, a lot of drained eyes, a lot of bedrooms made of cardboard. That is hard living and, guiltily, I’ve shirked away from it. I’ve only been downtown twice since the holiday madness ended and was struck by the darkness, the crammed decibels. I’ve been longing for spaces, for long ones humming gently in human-free life. I’ve longed for the companionship of trees, of plants not so tame as to live in buildings, or so dead that they’re twisted into a wreath and hung to dry. Yeah, well. The city is where I am. It takes more than a song to get out of here, especially on a Friday when rush hour starts early. And I’ve had work to do, words to write and spreadsheets to create. I’ve felt crazed with restlessness. The memory of sounds, the misery of stillness. So finally I escaped to the Blue Hills. To sea for him, to trees for me. I parked at the Great Blue Hill, which rises alongside I-93 in pines,oaks, maples, and ski trails, and began climbing the road to the weather observatory. It had snowed all morning and the trees and forest floor were white, but my soul still felt pretty bleak. 128 runs right along the hill and the noise of it moved right up the road—fuzzy mufflers, rasping engines, heavy tires, the occasional pitch of a horn. The drivers below were hurtling along in their aluminum cans, heading home and picking up kids, and doing so Loudly. Eventually I came to a path that rose into the woods, veering from the paving with steps made of the sort of perfect logs that build a cabin. Hungering for the uneven embrace of the earth I left the asphalt and carefully ascended the logs. They were slippery with the sneaky ice that lives in shadowy places and I took my time, feeling a tender rush of accomplishment after stepping off the last stair. “There’s lots o’ dead wood as ought to be cut out,” he said. “An’ there’s a lot o’ old wood, but it made some new last year. This here’s a new bit,” and he touched a shoot which looked brownish green instead of hard, dry gray. Mary touched it herself in an eager, reverent way. Dickon curved his wide smiling mouth. I didn’t count all the wick ones in the reservation, I just walked among the ones skirting my path. A quiet joy was spreading within me. I felt like I was strolling in the light of candles, ones that weren’t fussy and blown out by a breeze. I felt like a candle, glowing and warm. Eventually I came to the old building with a roof and two walls for picnicking. From there it was a short tripto the hill’s summit. When I arrived at the top I moaned a long, honest, appreciative Ohhh of appreciation for the haze below and beyond, for the hills and valleys and forests dressed in the lovely grey blue. All of it blended together perfectly, all those colors of New England that have lived here for centuries. As I went back down the hill, more patient now with paving, the snow filtered from the canopy like gilded motes, shining in the slanting sunlight. I walked in bliss and, when the traffic again began licking at my ears, kept on going. I had to join it, to go back home, to get to work. This post is devoted to sauntering, a rare art espoused by Henry David Thoreau which I have resolved to embrace in this still new year. Saunter posts will hearby be tagged Saunterday, so keep an eye out for them! Tonight, tonight. The streets are slicked in rain, smooth like a bathing elephant’s skin. There’s the sweetness of being alive in the wet, the beautiful feeling of washed air magically coupled with the rich wildness of fall colors. Honeyed yellows deepening to red. Marmelade. Occasional veins of magenta. Some chartreuse, even paler than usual in the street lamp glow. Leaves. Downtown there are ashes everywhere. Not from fires, per se, but the leaves of those street trees are lit in a burning yellow, loosing halos to the earth below. They lay in crowds around the tiny squares of soil surrounded by cement. I love the young things lining sidewalks and medians, dappled in their golden leaflets, but here in my neighborhood I am lucky and rich with ancient oaks and sugar maples instead, all shimmering in chiaroscuro. The aesthetics of rainy nights never fail to floor me. The shine, the sounds, the solitude. Tonight I walked, wearing heels from a night out, click clacking down one street to another. A skunk was out–my sole companion, glowing white as it browsed one of the area’s larger lawns. It was a quiet, quick, nonchalant creature, not remotely interested in me or a car that sped and splashed by. They die that way, thinking that they can fend off station wagons by spraying them. But this skunk just stayed on the lawn, nibbling in the headlights as I watched under my hood with hands in my pockets. Eventually I turned away, my mind in the night, my heart and soul rinsed in warm weather and beauty. I’m riding with the trees through transition. Last week I left Allandale Farm, the place where I’ve spent the last three years of my life. In August I’d begun my new position as the horticultural manager at Flora Explora, a landscaping company that deals primarily in Chinatown and Southie properties. It’s a big change, and I’m grateful for it. Leaving the farm and taking up with Flora is giving me the opportunity to learn about botanical entrepreneurialism as well as the space to hone my landscape design skills. And it’s given me a sweeter schedule, one that leaves me feeling more solidly on my feet. I wake up remembering my dreams. I’m alive in phases, in the changing moon and lengthening nights. This evening as I strolled I stood below a ledge-grown maple whose roots bulged hiphigh. I felt a gnarl and raised my face, my eyes climbing crevices and arms toward the canopy. I listened to the sound of leaves, green but brightening toward yellow. Fallen raindrops fell again to lower leaves and limbs. My eyes were full of light, of the chlorophyll that, come morning, will keep working until it is all shut down and captured within wood til spring’s great bud break. I looked up, my chest full of light, my mind racing with life, rushing with the knowledge of all the ecology seen and unseen before me. My heart felt like the set of Ferngully. I felt like Ferngully. It was magic, and it was a tree, and it was two blocks away, and it is October. One of the many Elecampane (Inula helenium) plants that I started from seed last year, now blooming in Boston. I began this post from my steamy bedroom a few nights ago, in the aftermath of the neighborhood’s Roman candle blasts and even louder late night party cackles. Summer, that grand doozy of a season, had spent the whole week sitting on this city, stifling everything and exhausting me as I did anything. I’d go for days in a wilt before some kind soul would grant me a blessing spun with lemon, lime, or watermelon. Naked water sat within me uselessly, my body stubbornly refusing hydration as it tsk-ed me for having such a lousy electrolyte balance. All was irate and fecund and full of color. Arthur broke the everlasting sweat with his billions of raindrops, and now I can sit here in the backyard, an umbrella stretched over my little patch of sleepy, breezy afternoon, and feel pleasant and not at all sunstruck. As I last wrote, June was a month of herbs. I taught several classes at Herbstalk, Allandale, and the Fenway Victory Gardens (of which there is YouTube proof). Herbstalk was especially amazing. I sold hundreds of plants and talked myself hoarse while trading ideas, tips, and techniques for growing and using healing plants with folks from all over the northeast. Farmside, I sowed tulsi and am now watching it flower tinily, enjoying its fruity, spicy, sacred self as it wafts around the garden center and through the greenhouse. The lovage and elder umbels of my victory garden. In my own garden everything is amazing, or at least vigorous and vivacious. My favorite part at present are the umbels. Those beautiful wheels of infinitesimal blossoms are anchoring the space in the white of elder, the chartreuse of lovage, and the firm red (lightened with sweet little pale centers) of ornamental yarrow. I also had valerian, started from seed and glorious in its tiny blushing blooms, but something—rabbits, I’m sure—trampled it and now it’s tenaciously starting over again, about six inches tall after its towering 48, photosynthesizing and fattening sleepytime roots for the winter and fall. I’m possibly busier than I’ve ever been before between the farm, landscaping, beekeeping, gardening, and general around-the-house-ing. And occasional socializing. And very infrequent resting. The living madness of my schedule has kept me from seeking out too much wildlife as of late, but I’m seeing tons of it incidentally which, really, is what I prefer. The best bit of wilderness that I’ve lately encountered fell from the sky, tumbling suddenly into a tray of pots being carried by a coworker. It was a tiny, scowling, perfect fledgling of a swallow. The little bird, only slightly tousled, looked at us as we ogled and oohed, admiring its jaded gaze and amazing wings. Its wings were clearly its best feature. They were so clearly those of a barn swallow—dark and beautifully preened in an almost violet, parallel tilt that met elegantly in a point. The tiny thing was clearly startled and shook slightly but its stare was steadfast, so fierce for such a miniature thing. Eventually we set the tray down on the ground, or started to before, without warning, the bird took flight. Its downy self, so squat and crabby, was instantly gorgeous as it flew through the wide open air, taking a pretty, curved path to its nest along the garage. What a pretty Independence Day. It’s been a crazy spring but here I am, ever so briefly, to tell you about Herbstalk, an event that I am very proud to be a part of. Herbstalk is a magical, nourishing, and delicious event created by my friend, herbalist Steph Zabel of Flowerfolk Herbs. In its third year, this celebration of healing plants bursts at the seams with good food, brilliant teachers, lovely music, and…HERBS! Herbs in every incarnation! You’ll find teas! Green salves! Powders! Smoking mixes! Scrubs for your face and body! Soaks for your tiny toes! There will also be live plants brought to you by yours truly, most of which I’ve started from seed and all of which I’ve grown with love at Allandale Farm. I am also honored to be teaching a class, Growing Urban Herbals, on Sunday from 11 to 12:30. I’ll be covering all the basics (and many of the more advanced techniques) of growing herbs in the city. There will be useful information for the amateur and experienced gardener alike. To get a taste of what I’ll be speaking about, check out my articles at the Herbstalk blog, like this one that focuses on the ecological benefits of growing herbs in the city (or anywhere, for that matter! ), and another on growing healing herbs indoors. I will also be teaching a class on container herb growing at Allandale on Saturday, June 14th. I’d love to see you there as well! Check out the blurb and buy your ticket here. In winter it can seem as if one’s surroundings are asleep and lifeless and devoid of inspiration. Not so! There’s life all over—at this very moment a gorgeous, auburn cardinal is perched in profile outside my window, its crest brightly transparent against the sun. You can go outside to find this life, and you can also take a look in some curious internet nooks. An adult female robin. Source. I’m always quoting and linking to The Cornell Lab of Ornithology, one of the very best authorities in the US on birds. Recently I came across this excellent question from a winter birder: why on earth are there twelve robins in my yard in January? Read the illuminating response here. The seemingly benign squiggle in this video is brought to you by a terrifyingly fantastic article from Scientific American’s blog The Artful Amoeba. In it, Jennifer Frazer examines spirochetes, the bacteria that wreak havoc on sufferers of Lyme disease and syphilis. (Note: while Lyme has traditionally been thought of as a disease of rural places, it is increasingly acknowledged that it can be contracted in cities such as Boston.) While I am scared speechless of Lyme, an epidemic that has affected far too many of my friends, family, and acquaintances, I have been fascinated by its tenacious brilliance ever since reading about its pathology in Healing Lyme Naturally. I appreciate Frazer’s view of spirochetes as amazing micro-organisms. I’m also a firm proponent of knowing one’s enemy, whether we’re talking garden pests or human diseases. Knowledge is power, especially on the microscopic level. A new piece from The New Yorker documents how Berkeley scientist Tyrone Hayes has been intimidated and blackmailed by Syngenta, a massive agricultural chemical company, for over a decade. This article sharply illustrates how industry and government no longer allow science to “speak for itself,” instead weighing it down by bales of red tape, propaganda, and bad guy stratagems that make the villains in Captain Planet look like weenies. In more arboreal news, plans to create a square mile of urban forest in Detroit’s lower east side are moving forward . I welcome the beginning of a new chapter of the ever-unfurling experiment that is 21st-century Detroit. While researching a little sentence in a facebook post I came upon this little gem of an article from the Milton Patch. It chronicles tactics used by Boston area snakes to survive the winter. One of those overwintering critters is this thing of orange beauty, the Timber Rattlesnake (Crotalus horridus). A tulip tree (Liriodendron tulipifera) in Prospect Park, Brooklyn. Source. The falling of leaves, that shedding of the suddenly unnecessary, undresses an urban beauty usually draped in colors that go beyond the relatively monochromatic shades of bark. As foliage starts to shiver and shake and pigeon-fly in earnest, the limbs sway in the slow dance of an autumnal Salome. They unveil until finally naked, muscularly curving and dangling, scrolling woodily across bright, cold mornings. In November we see not only more of the unfettered tree but also settings and props forgotten or heretofore undiscovered. Views obscured in satiny emerald and warm copper clear and come into focus, revealing fire escapes, painted doors, next-door neighbors and hibernating gardens. The leaves remaining transform to peppering accents, flicking faded maple reds and russeted elm onto concrete, sidings, attic windows and brick. Trees are bizarrely delightful and surround us on nearly every terrestrial surface. Despite our close quarters, most of us don’t know trees as we know the rest of our neighbors. Often we hardly acknowledge their beautifully ubiquitous and stories-tall forms. I feel that it’s time we took a look and got on a first-name basis. There are a lot of ways to acquaint oneself with a tree. First of all, I suggest you take a walk. Most cities have parks; go to your favorite one or visit their website to see if they offer guided tours. If they do, sign up. (You can also look to your city’s parks and recreation department, urban ecology centers, and universities.) Bring a friend if you’d like, or go alone and devote your whole self to the place and plants within. Ask questions. If you’re good at remembering things, remember them: the nomenclature, the shapes, the colors and textures of bark, lingering leaves, berries, and nuts. If you’d like you can write notes or take sketches, but if you’re on a first date it might be best to just spend some time together to see if you click. A wonderful thing about trees (and other plants, as well as just about anything even some humans) is that you can name them to your liking. This is especially useful when you’re starting out. While it is often helpful and even imperative to know scientific names, it’s almost never necessary in the beginning. I used to work with kids at the Arnold Arboretum and we would call the beech trees “Elephant Trees,” much more for their grey and stretch-marked skin than for their size. If you remember “elephant tree” rather than “beech tree,” that’s fine, and even lovely. There’s no need to be formal about anything; this is all casual. A first date is not a wedding (though at certain times of the year there may be flowers). If you are hoping to eventually become a botanist wholly and microscopically devoted to beeches, no one’s going to care if you started out calling a tree that looks like an elephant a tree that looks like an elephant. Purple European beech (Fagus sylvatica ‘Atropunicea’), photographed at the Arnold Arboretum of Harvard University. Source. If you can’t find a guided tour, take yourself for one. You can stroll with the sole intent of making your own independent observations or print off a street tree guide and go a-hunting. Grow Boston Greener has a truly guide for the greater Boston area. Other city-specific web guides include those for New York City, Richmond, California and Dallas, Texas. There are also some handy ones from Cornell and The Virginia Urban Street Tree Selector, as well as real live books like Lelsie Day and Trudy Smoke’s Field Guide to the Street Trees of New York Cit, and Peter Del Tredici’s brilliant Wild Urban Plants of the Northeast: A Field Guide. (I’ll elaborate on Del Tredici’s in a minute). If a search for a resource specific to your city yields no results, never fear; plenty of street trees, like the Norway maple and horse chestnut, are regionally ubiquitous. Get an idea about what you might find in your neck of the country and see if it’s there. You’re certain to find something, whether it’s what you were looking for or not. If you decide to get a little more serious I recommend a good field guide. Sometimes you can take them out of libraries, an opportunity to be taken advantage of, especially when you’re looking for one that will suit your needs. Some are illustrated with photographs while others are drawn by hand. Some focus on leaves and others on bark. Regardless of the guide you get you’ll want at least one with a good key. Keys can be frustrating to use, especially at first, but they are indispensable. The instruction on how to use them is indispensable, too; far too often people complain that a field guide is faulty before admitting that they have no idea how to utilize their key. This is a very enjoyable book. I’ve had the pleasure of meeting the author and photographer, Michael Wojtech, and found him to be a delightful, quirky young naturalist who quotes Dillard and designs cool t-shirts. The key is not quite infallible, but bark, the wonderfully varied skin that shelters and encases everything within—cambium, phloem, heartwood and the like—is not only varied from species to species but, quite often, from specimen to specimen. Our native sugar maples, for example, go through so many transformations in a lifetime that they are nicknamed “the chameleon tree.” Because of this variability a field guide that relies so heavily upon bark for purposes of identification is bound to give you a taxonomical hiccup here and there. Luckily it also includes illustrations and descriptions of other parts of arboreal anatomy—leaves, seeds, etc—so a positive ID is always within your reach. BARK is a meticulously researched field guide from a lover of forests and aesthetics. It’s a wonderful, slim guide for new and seasoned tree-lovers alike. This book is a classic, and as field guides go it is almost biblical in scope. Hard-covered and a buncha pounds, it’s not exactly something that one would enthusiastically carry through the streets and parks on a frigid winter’s day. However, it’s amazing and definitely worth carting about (though I do recommend that you have a backpack so your hands can be free). Of the field guides I have known and researched, this one seems the best all-in-one package for winter identification. (The best that’s under 30 pounds, anyway.) Every entry features wonderfully detailed photographs and occasional drawings illustrating species’ buds, bark, leaves, and mature size. The images of buds, those miniature gift-wrapped packages of gorgeous and varied life, are especially helpful for winter ID. While the above books are wonderful, both independently as well as in tandem with one another, their one flaw for the cosmopolitan tree-gazer is their emphasis on natives. Many of the most common street trees, such as Tree of Heaven (of “A Tree Grows in Brooklyn” fame), Japanese Maple, and Ginkgo, are fairly recent migrants to North America. For these trees, Peter del Tredici’s “Metropolitan Field Guide to plants and trees of the Northeast” is unrivaled for detailing the botanical life that twines and thrusts through our cities. Del Tredici’s book also features dozens of herbaceous plants, thus offering as thorough a census of street plants as you can get without its turning from paragraphs to charts. He also includes cultural uses for plants (ie, whether or not they have been been used for culinary or medicinal use), and little biographies that tell how the non-native plants came to be in North America. The species entwined in our botanical gardens and arboreta are another thing altogether. Here in Boston we have Dawn Redwoods from China, mock oranges from California, and a teeny tiny Bald Cypress bonsai, all alive at the Arnold. Though these trees are far from native and atypical to the urban habitat that they’ve found themselves in, they are richly wonderful living things to spend one’s time with. Not only are they beautiful, regal, and impressive for their existence in a place so different from, say, rural China, they also help us to better understand the abundance of diversity within the botanical world. The Arnold, along with many other professionally tended public gardens, carefully dog-tags their plants with labels that include common and scientific names, the botanical family the specimen belongs to, provenance, and other information. Do you have advice for meeting the trees in your neighborhood? This post is lovingly dedicated to Kelli Korducki, who recently announced her desire to know trees and asked if I could be of service. Cheers and happy walking to you, Madame Duck! Let us know how you’re arboreal discoveries go. Late October brings one thousand remembrances that creep in through the tasks. It is a time of analytical repose juxtaposed by all the hurry of putting gardens and fields to sleep, of sealing drafts and catching mice, of collecting sawing chopping splitting and stacking. There are apples to bring in, sauces to simmer, cookbooks to pour over in hopes of finding one more reason to keep the oven going. Coats to be dug out. Mittens slated for darning and knitting needles and patterns fetched from hiding and put to work. Autumn’s combinations of sitting and sprinting and, you know, this thing called the World Series, have sent my mind a-wandering to Fenway Park. Oh, Fenway. Storied pleasure ground of fathers and sons, fanatics and franks, curses and delight, you are the unofficial last gem in our city’s emerald necklace. Green and lit, mown and chalked, you are our beloved theater, the treasure chest of tricks, our Neil Diamond music box. We were all too creeped out by the #usmovie bunnies so this year we celebrate the Easter Horse.